Mike Moustakas clubbed a homer in the first inning and the Royals erupted for five runs off Doug Fister in the sixth Thursday night to beat the Astros for the third night in a row, 6-2, at Minute Maid Park. The Royals pieced together six consecutive hits after two away off Fister in the sixth, including a two-run double by Eric Hosmer. Royals starter Ian Kennedy held the Astros off the board until the seventh, when Jose Altuve homered for the second game in a row, cutting the lead to 6-1. "We just didn't play well enough," Astros manager A.J. Hinch said. "They outplayed us and earned the series win. I think what you find, against good teams, when you give them a few opportunities or a few extra things, they capitalize on them and the Royals are best at that. They don't let you up off the mat once they get you down, and it's a tribute to how they play the game and the successes they've had." Kennedy (2-0) retired 14 of the first 15 batters he faced and carried a no-hitter into the sixth. 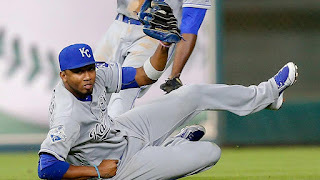 Carlos Gomez led off the inning with a single, but was doubled off the base on a terrific play by shortstop Alcides Escobar, who made a sliding catch in center field and whirled to throw out Gomez at first. "He was every bit as good as his last time out (6 2/3 shutout innings)," manager Ned Yost said. "He just commanded everything really well and managed his pitch count really well." Big sixth: The Royals, much like Game 4 of the ALDS, struck for a big inning. The Royals produced six straight hits and wound up with five runs to blow it open 6-0. Hosmer had the big hit, a two-run double. "We hit a lot of balls hard right at people," Yost said. "Then in the sixth, things started falling in finally." LED there be light: The Royals' rally in the sixth came after right fielder George Springerlost a sinking liner hit by Lorenzo Cain in the lights with two outs. The Astros installed new LED lights at Minute Maid Maid Park this year, and Springer has had trouble with them a handful of times so far. "Yeah, they're tough," Springer said. "It's bright. It's not easy to see the ball. It cost us a game today." Hosmer said the Royals were ready to take advantage of any break they got. "That's what good teams do," Hosmer said. "You find an opening and you do some damage." The Esky play: In the bottom of the sixth, Escobar made the play of the game, maybe the season. Marwin Gonzalez, with Gomez on first, hit a looper to center field that Escobar chased it down, running all out with his back to the infield. Escobar made an over-the-shoulder catch, rose to his feet and gunned a strike to first base that doubled Gomez up by an eyelash. "That's a really hard play," Escobar said. "... Wow. That's a really good play." Time for turnaround: In losing three of four games to the Royals, the Astros fell to 3-7, which certainly comes as a surprise for a team some picked to win the American League. It's still early, and Hinch said the Astros need to do a better job moving on when things don't go their way. Royals: The Royals open a three-game series in Oakland on Friday night at 9:05 p.m. CT. Right-hander Edinson Volquez (1-0, 1.54 ERA) takes the mound for the Royals on Jackie Robinson Day around the Majors. Astros: Dallas Keuchel takes the mound Friday night against the Tigers at Minute Maid Park at 7:10 p.m. CT. He was 15-0 with a 1.46 ERA and 139 strikeouts at home last year during the regular season, becoming the first pitcher in Major League history to finish a season with at least 15 wins while being undefeated at home. This is his first home start of 2016.